The site providing both of these examples is Orgnet.com. Although these examples are interesting, I think they need to be developed futher to deliver value or actionable insight. This TED video show's Jonatahn Harris, who has a really interesting project where he is monitoring the sorts of emotions being expressed on the web, with some wonderful innovative ways of representing information. Whilst I do not feel that he has cracked the problem, I think that he shows us that solutions are out there waiting to be discovered. You know you are out of date when you see books for Dummies on a topic you only heard about last week! Just last week I picked up on the enormous amount of interest that is being generated by machinima. Very loosely, machinima is making films using the engines and techniques of games. So, instead of using the very expensive 3D rendering tools used by Hollywood, machinima directors use the 3D rendering tools of games like Oblivion. 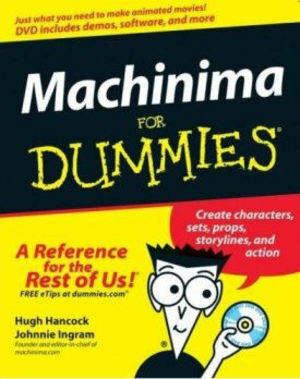 The word machinima may be a contraction of machine cinema or machine animation - or it may not! If you want to start playing with this, then the fine folk at Wiley have released "Machinima for Dummies", I spotted this book in BoingBoing. To get an idea of what people are doing with machinima here are two YouTub clips. How much paper would Wikipedia need? Boing Boing has a post and the graphic below showing how much paper would be required to print out the English language version of Wikipedia. However, it is a bit of an underestimate since it does not include the history or discuss pages, and makes no allowances for images or tables. August 7th, 1991, Tim Berners-Lee made the World Wide Web publicly available on the Internet. Wired has a short article covering this anniversary. The key point for me is as a reminder of how quickly things are changing. My daughter is 22 and can remember the world before the Internet, my two boys are 15 and 17 and for them the Internet has always been there. The pre and post WWW generations will be very different people, IMHO. Online Media report an interesting survey by InsightExpress into users and cookies. As part of the study they asked people to remove cookies and then asked them whether they had been successful. They also measured whether people had actually removed the test cookie. The answers show that many people are deluding themselves and that competence is low. InsightExpress also conducted the same test in 2005 and it seems people are getting more confident about their ability and less able! The study showed that more people claim to be aware of cookies (up from 77% in 2005 to 85% in 2007), but only about a third consider them important, the same as in 2005. This study should remind us that people are a lot less familiar with the Internet than we might assume. For example, when designing online surveys we should not assume people can necessarily close windows, maximise window, download plugins etc. Kurzweil highlights an article by Wade Roush which predicts that the Web will morph into a giant, earth absorbing World Wide Sim. Whilst I found the article interesting, I think the real future of meta-worlds will be when we have more avatars driven by personalised AI. I don’t have the time to wander and fly around Second Life, nor to meet new people when I could be working, blogging, talking to my children, or playing rugby. What I want is to be able to have two or three avatars, each armed with an aspect of my character, sent out on missions. One might research holiday resorts, one may convey greetings to people I really ought to keep in touch with, and another may head out and interview somebody. Check this video out to see how Xerox are using Second Life. I am still not convinced by Second Life, but I have been wrong before. MrWeb have reported that comScore have launched comScore Web Metrix to track the usage of widgets across social media. The top three widgets at the moment were Slide, RockYou, PictureTrail. Widgets are seen as key to the Web 2.0 revolution by many as they allow users to add functionality to their sites without having to edit code or write scripts.